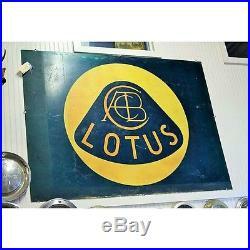 Vintage Lotus Automobile Outdoor Dealer Sign. Very large and transparent enough to shine a light through and illuminate! Shows the wear typical for an outdoor sign of this age. 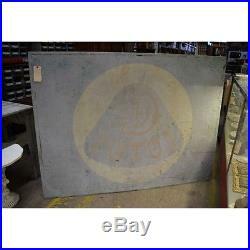 Measures approximately 69" x 51". We can't think of another use of a sign this size that can be light up from the back than to be a dealer sign! 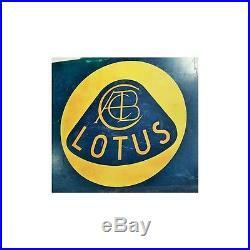 The sporty British traditional racing green and circle yellow sum are immediately recognizable as Lotus. Eco Relics was established early in 2014 by Michael & Ann Murphy. We built a company that prides itself on keeping usable construction supplies out of landfills and saving as many architectural remnants as possible. We are devoted to preserving historical architectural building materials. We are dedicated to keeping architectural salvage and building materials out of our landfills. We are always looking for opportunities to reclaim and salvage building materials that would otherwise be sent to dumpsters and trucked to landfills. We want to discount building materials to renovate older homes with historical accuracy. Eco Relics is committed to reducing waste, repurposing supplies, and providing reclaimed building materials at a reasonable cost. We want to provide a place where people that share our commitment to the environment and can reuse and repurpose what we salvage and sell us their unneeded items. 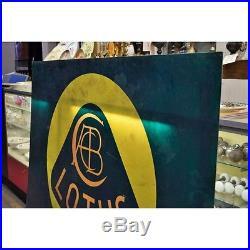 The item "Vintage Lotus Automobile Outdoor Dealer Sign" is in sale since Thursday, March 05, 2015. This item is in the category "Collectibles\Advertising\Automobiles\British\Other British Automobile Ads". The seller is "ecorelic" and is located in Jacksonville. This item can't be shipped, the buyer must pick up the item.